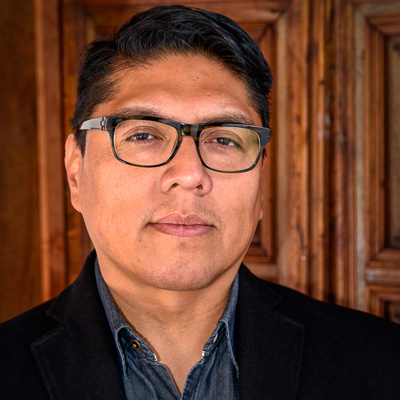 On a recent Friday afternoon, Brian Vallo, Director of the Indian Arts Research Center, sat for an interview with Mary-Charlotte Domandi, host of Radio Café. The two embarked on a discussion about the past, present, and future work of the IARC. Across the interview Brian and Mary-Charlotte explore topics ranging from the origins of the Indian Arts Fund and current collaborations with source communities to public accessibility to the collections and the upcoming 40th anniversary celebration on Friday, June 22. Listen to the full interview below and purchase your tickets to the anniversary event here. Thank you Mary-Charlotte Domandi and the Santa Fe New Mexican for the opportunity to share this history and what we do with your listeners. The number four is significant to most Native American indigenous communities. Sometimes it is a reference to the directions, cycles, or seasons. So we thought, ‘Let’s celebrate the 40th.’ This facility was built forty years ago; that was the time that the Indian Arts Fund collection moved into the spaces that have become its permanent home and we’ve achieved a lot over that forty years. 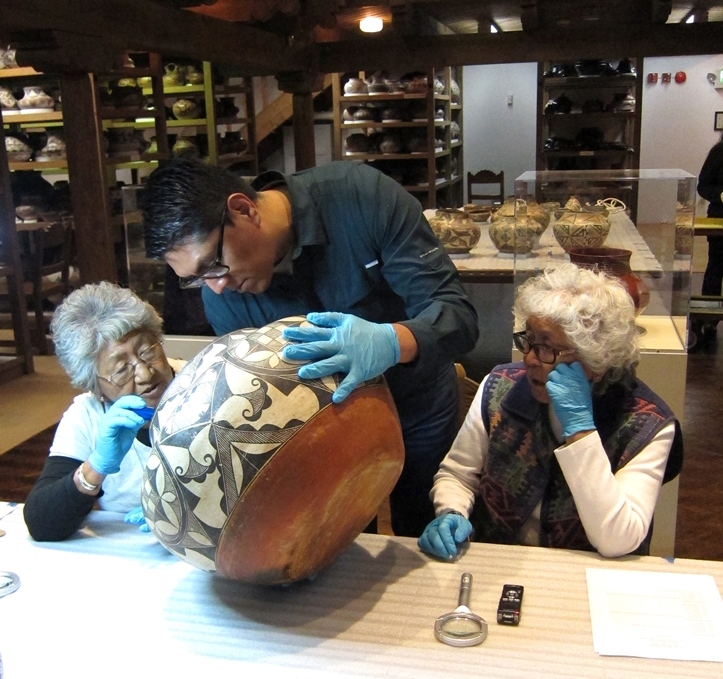 We’ve hosted a total of seventy five Native American artists from all over the country, and we’ve hosted close to fifty interns and have held a number of events that have offered engagement by our source communities with the collections. There have been a number of publications about the collections, and many of these materials have left our vaults for exhibits. So we want to commemorate that. The event on the 22nd is to celebrate these achievements. 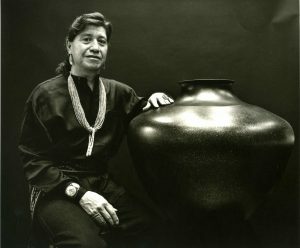 By the time the Pueblo Pottery Fund was established, people in the Pueblos were very guarded, very protective of their lands of course… By then there were relationships that had been established between neighbors who surrounded the pueblos and also with a number of scholars and collectors who already had established ties with communities and specifically with tribal artists or tribal leaders … The Pueblo Pottery Fund, the folks who were involved, had the intent of purchasing materials. I believe that the Pueblo Pottery Fund was based on this idea that there needed to be some compensation. I don’t know that they took the time to explain the intent behind this collecting, but I think there was a level of respect that was offered. Indigenous communities work very hard every day to sustain themselves and to sustain these cultures even while there is all of this influence. And the Indian Arts Research Center, through our artist fellowship programs, through these collection review processes, though our symposium, we bring these tribal people, tribal representatives, together to talk about some of these critical issues and shared concerns. The core of all of this is establishing trust—mutual trust—establishing an understanding of what our goals are in this process. It has to be mutually enriching and rewarding … We don’t have access to these experts based on our calendars. These communities thankfully are still observing a cultural calendar … They have ceremonies, they have feast days, there are communal events that happen throughout the year. The seasons observed are very critical, and we would never try to pull them away from those responsibilities. So these are some of these critical considerations, not forgetting on the institution end that these are thriving cultural centers. It’s a process of building trust, building a level of understanding that allows us to organize a successful review experience for both the community and SAR. With Acoma it has been really interesting with the potters, because they have such great memories and they have been able to identify and create classifications of pottery that we didn’t have before this engagement. 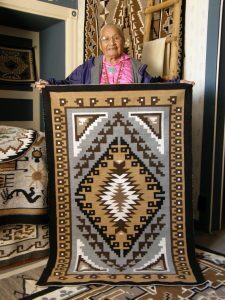 There was also a very strong textile tradition at Acoma that is now lost. It was predominantly male. Males were the weavers; males were also the basket makers, though there were some women who also made baskets. That weaving tradition, it’s unfortunate that it has been lost. We estimate that the last weavers traded their textiles in the 1880s … There are some in museum collections, we have a few here at SAR, but that weaving tradition is rooted at Acoma in a sensitive cultural context. 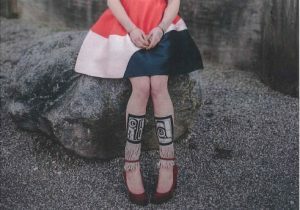 So, that knowledge, that traditional knowledge, associated with that tradition is lost.